Welcome to the worlds greatest guide to Women's Cycling Shirts. Are you actually looking for Women's Cycling Shirts? Well, we hope you are because the reality is that you have found our page on the subject. 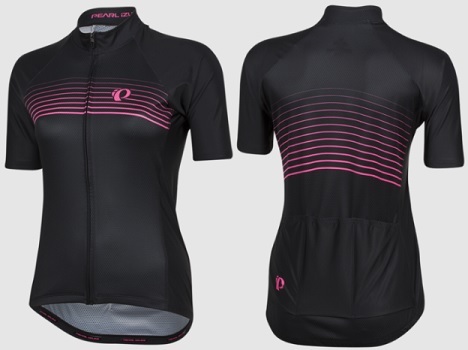 In this women's clothing section of the Apparel Search directory, you will find all sorts of interesting information regarding ladies cycling shirts. People engaged in cycling are referred to as "cyclists", "bikers", or less commonly, as "bicyclists". Clothing is not necessary while biking. However, it is helpful if you don't wish to get arresting for indecency. OK, in all seriousness, people can ride a bicycle in nearly any type of clothing. Some clothing is more appropriate than other types depending on why you are biking. If you are racing, you would be best served in tight fitting garments to reduce the wind draft. On this page, we will discuss cycling tops for women. If you want to ride faster, be sure to research anatomic fit, aerodynamics, fabric innovation and much, much more. A bike jersey made of form–fitting material reduces drag when you ride. This type of athletic top is also called a cycling jersey. Cycling jerseys typically have the back longer than the front. They also may have pockets on the back side of the jersey. Semi-autolock zipper can be flipped up and tugged open with one hand for easy venting. Stand-up collar to shade your neck. You will find many styles from raglan sleeve, short sleeve, no sleeve, singlets, long sleeve, etc. You may also want to research "bibs" which are tops and bottoms combined. Cycling, also called bicycling or biking, is the use of bicycles for transport, recreation, exercise or sport. This activity can be performed in almost any type of shirt. However, special cycling shirts are available and encouraged. Learn more about cycling shirts. You may want to also learn more about compression clothing such as compression shirts. Return to the top of this Women's Cycling Shirts page.